This hawkweed is common and widespread throughout the UK and Ireland. There are very many species of hawkweeds. 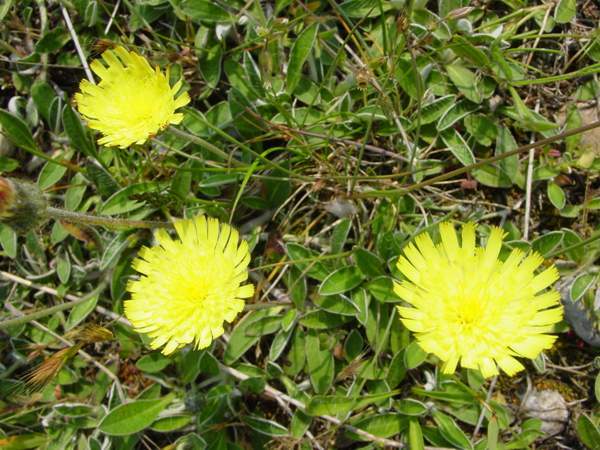 The spindly plant shown here, mouse-ear hawkweed, gets its name from the hairy oval leaves at the base of the plant. On roadside verges and grassy banks, these flowers are seen from May to October but are at their best in mid summer. Fox-and-cubs an orange hawkweed, is also abundant in the UK, and can create a spectacular roadside display in high summer. The picture on this page was taken in August.